Every horse is different. One horse gets fat from the air, the other is hard to keep on weight. With roughage you can respond well to the condition of the horse. Rough feed adjustment is preferred over a solid feed solution. Natural rank horses are often temperamental. Extra energy in the form of sugar and starch, as in concentrated feed, will strengthen the temperament and make the horse difficult to handle. A large amount of coarse hay, possibly in combination with some pre-drying, offers at least a more suitable energy source. If you want your horse to gain weight, you can use extra concentrate in the diet, but be careful: this can cause disturbances in the digestive system. Introduce extra concentrate slowly and carry no more than necessary for the training level. Another way to improve the body condition is cornbread or Lucerne-mix. Most horses who are too skinny get or have too little or too bad roughage. Lucerne-mix in the ration improves the condition of the horse and ensures that more ratio is achieved from the mix. Quick and restless eating behavior can play a part in the digestion of the food. Because the horse does not chew properly, little saliva is produced, which causes the small intestine to digest food quickly and less nutrients will be absorbed into the blood. By mixing Lucerne-mix with concentrate, the horse must chew better, make more saliva and use the nutrients better. If this does not produce enough results then temporary maize broth can be added. Due to the high energetic value of corn, the horse's condition is improved. In addition, ensure regular deworming and check the dental situation every year by the dentist. If your horse is too fat, it is important to look critically at the ration. Because a modified diet requires sufficient protein, minerals, trace elements and vitamins to contain a low energy content, a special composition may be necessary. Weight loss with policy is very important because it involves rigorous weight loss. If too much pony suddenly receives little food, a metabolic disorder may occur and the pony gets hyperlimium (fat in the blood). If a horse or pony is too fat, this always means that the current ration contains too much energy for what it needs. Try to estimate or calculate the energy content as accurately as possible and create a new ration with about 60-75% of this amount of energy. 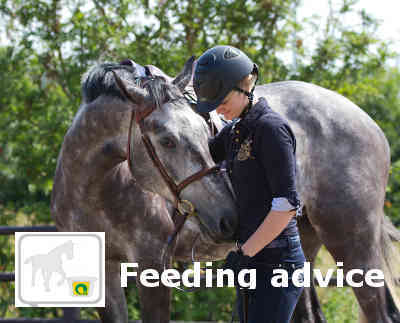 Reduce in concentrated feed and give the horses more roughage. Give roughage with a lot of structure, but little energy. Responsible weight loss must be done by eating less, but also by moving more. By doing work, you stimulate the burning of fatty acids into the muscles, so this is the best slimming diet in combination with a correct ration. Horses and ponies of varieties need relatively little energy. The roughage deserves a lot of attention in the ration. Lucerne mix and / or grass mix are quality low-energy raw materials and contain many vitamins and minerals. For horses that are apt to grow fat, Balance Structure Muesli is the best concentrate in addition to the ration. This total feed ensures sufficient vitamins and minerals in the ration.